I have fond childhood memories of kitchens lined with cabinets in sunny hues, so yellow in the kitchen feels very warm and welcoming to me. I can practically hear and smell the bacon and eggs cooking in this charming kitchen and in the previous example. 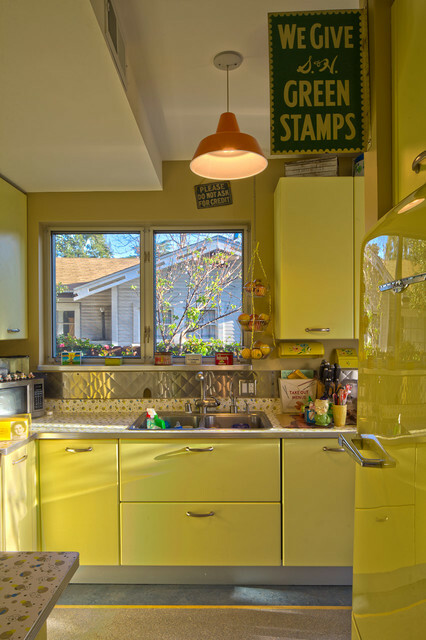 When picking a yellow color for the kitchen, take inspiration from your favorite flavors. Whether you favor soft and buttery hues, zesty lemon or a mellow banana yellow, you can’t go wrong surrounding yourself in a delectable color.